The House Science Committee’s Republican members will seek increased support for basic physical sciences research in the fiscal year 2018 budget cycle, and they are renewing efforts to influence the allocation of research funding at several agencies. The majority and minority sides of the House Science Committee have outlined priorities for the fiscal year 2018 budget cycle in their annual “Views and Estimates” letters to the House Budget Committee. The Republican majority indicates in their letter that they will pursue “full reauthorizations” of the science agencies under their jurisdiction in order to “rebalance priorities” and will seek increased support for basic physical sciences research. “These are the areas with the greatest potential for scientific breakthroughs that will benefit new industries and U.S. jobs,” they assert. Although the specific policy proposals outlined in the letter are quite similar to those advanced in previous iterations of the document and are consistent with policy priorities announced on Feb. 1, the prominent mention of physical sciences is new. Making funding for U.S. Global Change Research Program activities contingent on a determination that the research is not duplicative or wasteful. NSF has six discipline-focused research directorates that together currently receive close to $6 billion annually. In recent history, Congress has only set this topline funding number, allowing the agency and administration to decide how to divide up money between disciplines. However, under the chairmanship of Rep. Lamar Smith (R-TX), the House Science Committee has sought to influence the balance of funding between these directorates. Most recently, Smith’s “America COMPETES Reauthorization Act of 2015” would have authorized funding levels for individual NSF directorates, decreasing support for geosciences and social sciences and boosting support for other disciplines. The House passed the bill on a mostly party-line vote and the Senate did not pick it up. Appropriations committees are not bound by these funding authorizations, but the figures do serve as markers of the spending levels that policy committees and Congress regard as appropriate. 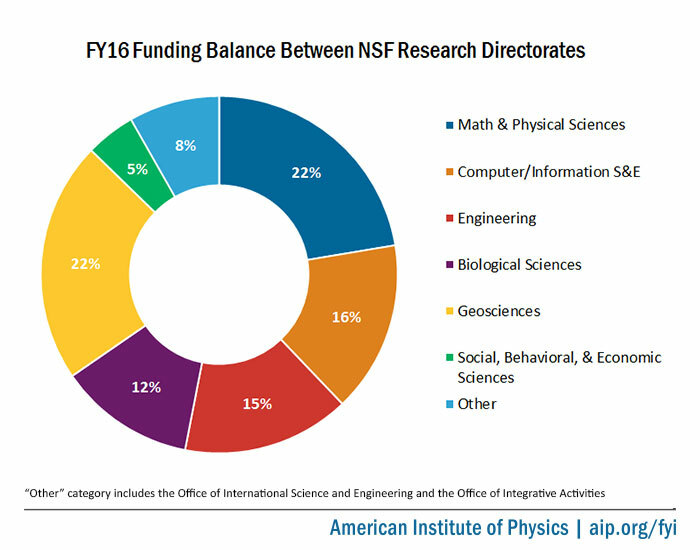 This year’s views and estimates letter says that the committee will “require that NSF research funding be appropriated at the Directorate level” and that 70 percent of the research funding be split among four directorates: Mathematical and Physical Sciences, Engineering, Biological Sciences, and Computer & Information Science & Engineering. Such a move would effectively either cap or reduce funding for the Geosciences and Social, Behavioral, and Economic Sciences (SBE) Directorates. The House appropriations subcommittee for NSF has been receptive to similar proposals in the past. It included instructions in fiscal year 2015 appropriations legislation that limited the growth of the Geosciences and Social Sciences Directorates that year, and included similar restrictions in instructions accompanying the House’s fiscal year 2016 appropriations bill. However, at the beginning of the fiscal year 2017 appropriations cycle, the chair of that subcommittee, Rep. John Culberson (R-TX), said he no longer supports designating research funding levels by directorate. The committee is at different stages in the reauthorization process for the science agencies under its jurisdiction. Last year, Congress updated policies at NSF and NIST through the bipartisan American Innovation and Competitiveness Act. However, Congress was unable to agree on funding authorizations for the agencies and so excluded them from the final bill. The committee has already begun the process of developing legislation for NSF this year, holding two hearings focused on the agency so far. Also, the House has passed the first-ever comprehensive authorization bill for the Department of Energy Office of Science and the first major policy update in over a decade for the National Oceanic and Atmospheric Administration’s weather research and forecasting programs. These bipartisan bills draw heavily on legislation that did not make it across the finish line last year. Senators have introduced the House-passed version of the NOAA bill, but there is no indication as to whether the upper chamber will take up the DOE bill. Farthest along is the NASA Transition Authorization Act, which President Trump signed into law today. However, the bill only authorizes funding for fiscal year 2017 and is largely silent on certain contentious policy areas, such as NASA’s Earth Science program. Congress could pursue a more extensive bill later this session.